My jaw is trying to explode again. Feels like someone is jabbing an icepick into the bottom left spot where the wisdom tooth used to be. Starting to wonder if I should go to the dentist. It’s not just the one spot that hurts, the other side hurts in the same spot as do the joints themselves. Okay. Moderately productive day. Didn’t get to laze around as much as I wanted but I got some good down time in. Since I took some painkillers at 5am when the Little Man woke us up around 9am I wasn’t feeling too bad in the pain department. Just tired. Hands are doing the dry, cracking, bleeding thing. Doesn’t matter how much or what kind of moisturiser I put on. I’m thinking of putting on some of my steroid cream before bed. Here’s to hoping the little guy goes to sleep soon. Was exhausted and cranky most of the day after my 6 hour long outing yesterday. VERY stiff and sore when I woke up. Loosened up as the day wore on but the tiredness and cranky stayed. Around 4pm my energy levels lifted a wee bit which got me off the couch at least. I realized I really needed to to get some things done around the house so popped one of my all natural energy pills. Got what needed to be done finished. Still feeling really worn out and sore but at least I accomplished something. My psychiatrist (or is it psychologist?) and I have agreed to switch me from Cipralex to Cymbalta. Cipralex helps with anxiety and depression while the Cymbalta helps with anxiety, depression and FM pain. SO the switch over started today. Cipralex dose dropped to 20mg, adding 30mg Cymbalta. Will do this for 7 days then drop the Cipralex dose to 10mg, keeping the Cymbalta at 30mg. Wait another 7 days, stop the Cipralex, bump the Cymbalta up to 60mg. One of the things I hate about new drugs is the side effects. Nausea is the most common side effect of this one and it’s definitely there. Still haven’t gotten through to my Rheumatologist who I am supposed to see next month. HIGHLY unprofessional. I’m not pleased. I know, they look like vampire bites. 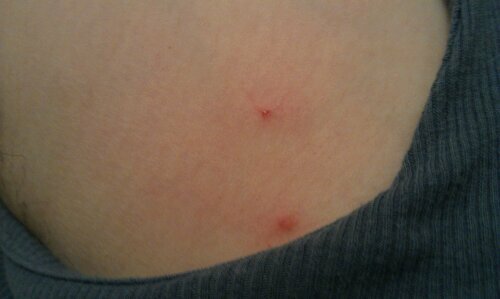 They were these little flakey spots, itchy, so I scratched them absently and this happened. Fun huh? Been really stiff and sore, very low energy levels. Still managed to get out a couple times this week for some exstensive walking. 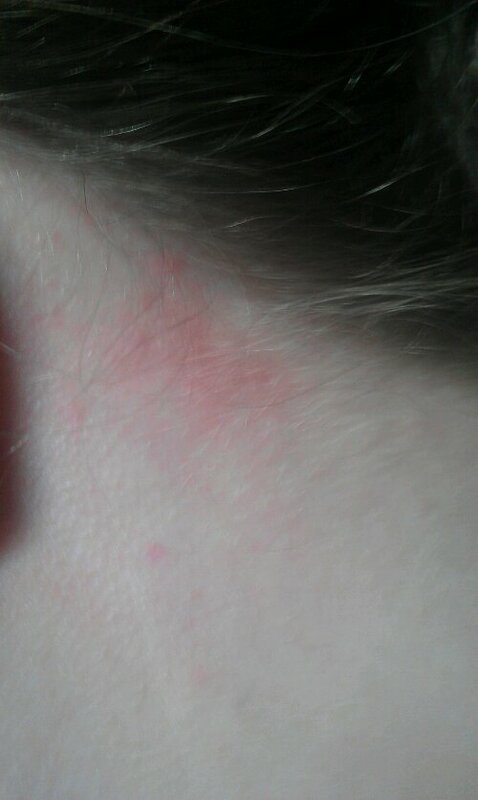 The psoriasis (or what MAY be psoriasis) is driving me buggy right now. Have had to pull out the topical steroids. 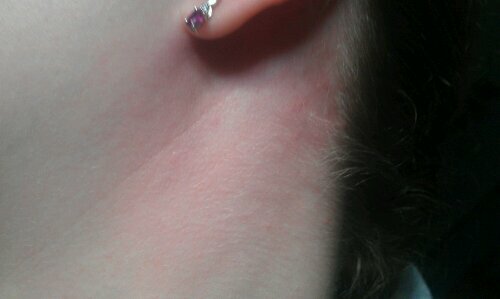 My scalp, eyebrows and the areas behind my ears feel like they are on fire. Eyebrows were flaking real good. Scalp about medium. The spots behind the ear are new. I’m trying to remember to take more pictures. 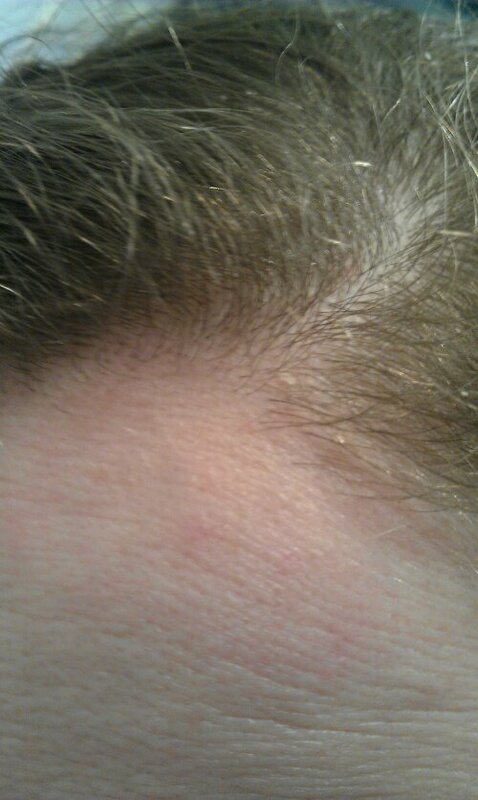 Only a tiny bit of flaking on the scalp in that spot. I can’t get pictures of the other ones right now, they are hiding in my hair. Cervical spine was much better today. Sitting around 7-8 which may seem high but in comparison to an 11 it’s amazing. Started spring cleaning. Will probably regret it tomorrow.